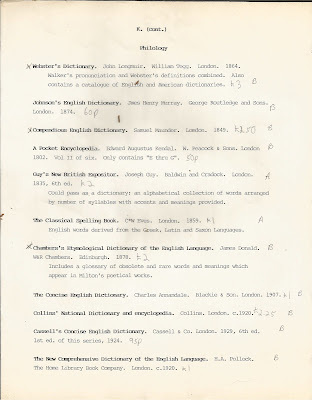 I have an extensive collection of books by authors who loved words: dictionaries, quotation books, grammars, and other books about the English Language –– over 200 of them. I call this collection "My Philology Collection." 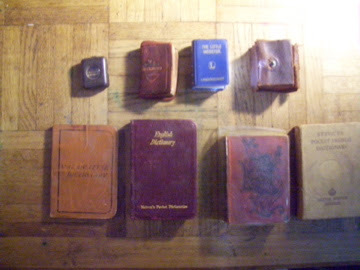 And today I will display and discuss some of my dictionaries. 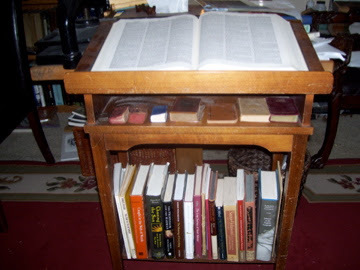 Dictionaries have a warm place in my heart because they were among the first books I collected. I had been a reader for most of my life, but I didn't become a book collector until 1985 when I was thirty-eight years old. 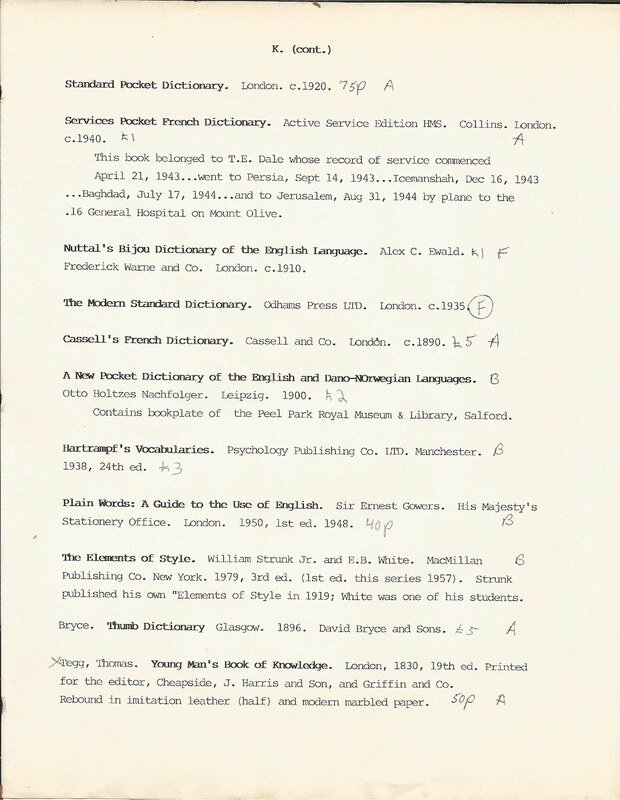 Here's a copy of the catalogue of my first Philology Collection. I compiled the catalogue in the late 1980s while I was stationed at RAF Mildenhall, England, my last assignment in the U.S. Air Force before I retired in 1989. The "Xs" on the left denote items which are no longer in my Philology Collection. The letters on the right denote the origin of purchase, with "B" standing for bookstore, "A" for auction, and "F" for book fair (the circled F stands for free). The average exchange rate in the late 1980s was $1.50 per £1. 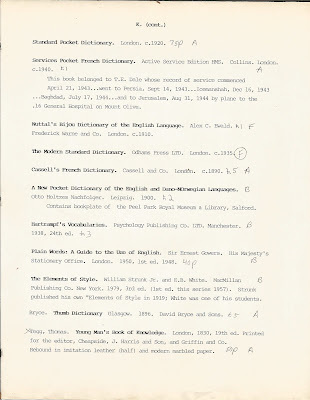 An Off-Topic Note: The dates of publication listed below for the first editions of The Elements of Style are incorrect. They should be 1959 for the Strunk/White edition, and 1918 for the Strunk edition. More on Strunk next month! This was a nice set, bound in leather, and even had quotations to display usage of words à la Johnson. But I had to sell it to make ends meet in 2006 while waiting for my disability retirement to be approved. The word philology means simply "the love of words." But its definition has expanded through the years. 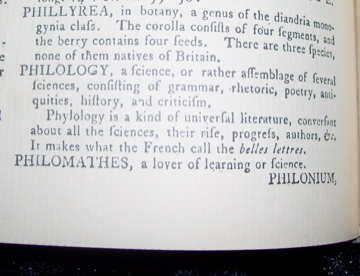 In his dictionary, Samuel Johnson defined philology as "criticism; grammatical learning." One need only look at the titles of Samuel Johnson's own "Philological Tracts and Prefaces" to comprehend his definitions. He considered critical observations of literary works to be a part of philology. 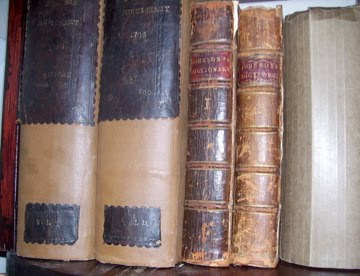 My oldest dictionary is a Johnson's Dictionary, the 1770 Fourth Abridged Edition, and I have two copies of it. I also have the 1785 Sixth Edition Quarto. 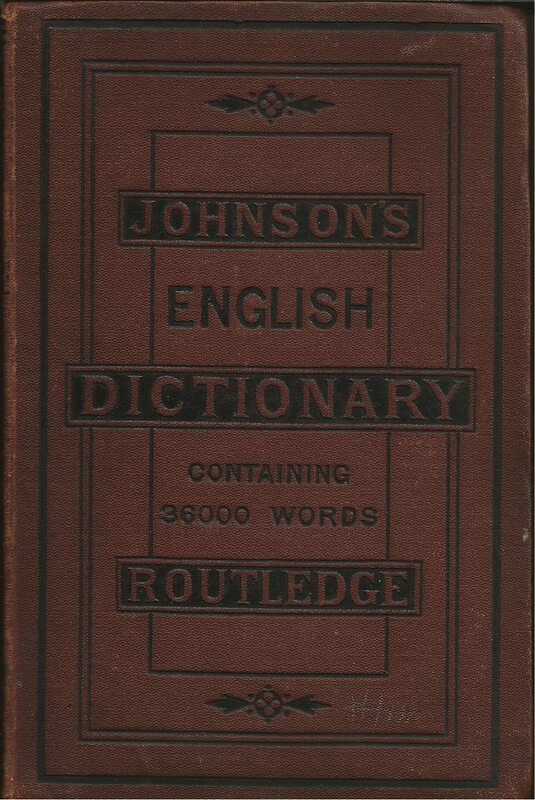 But my first Johnson's Dictionary was an inexpensive 1874 Routledge edition edited by James Henry Murray, of OED fame. 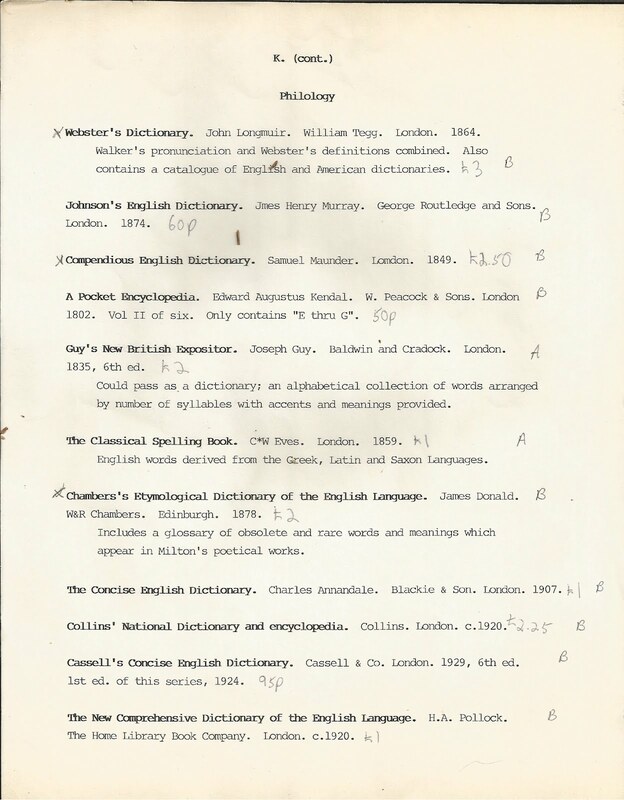 In this dictionary, Murray defined philology as "the knowledge and study of languages." This work was first published serially in fascicles from 1768 to 1771. I have a facsimile edition which I bought at a village auction in England in the late 1980s. At the time, I thought I was bidding on the real thing! Johnson's Dictionary isn't the only dictionary from the 1700s in my Philology Collection. I have the 1775 edition of Bailey's Dictionary. I bought this copy rather inexpensively because it had a cracked spine. Nathan Bailey, if you're curious, defined philology as "The Study of Humanity, or Skill in the Liberal Arts and Sciences." 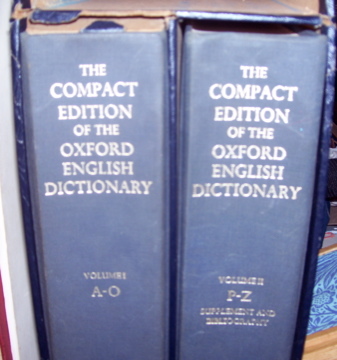 I have several Webster dictionaries in my Philology Collection. 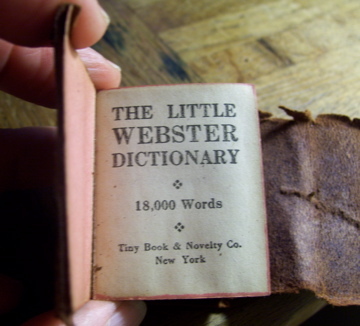 Here is my smallest Webster, The Little Webster Dictionary, published around 1930. Still can't read it? It reads: 1. Love of learning and literature; the study of literature, in a wide sense, including grammar, literary criticism and interpretation, the relation of literature and written records to history, etc. ; literary or classical scholarship; polite learning. Now rare in general sense. 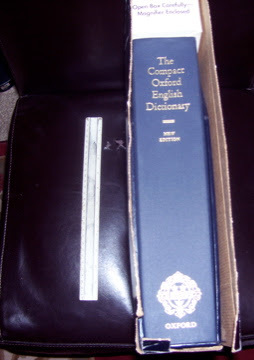 I will describe my two smallest dictionaries. 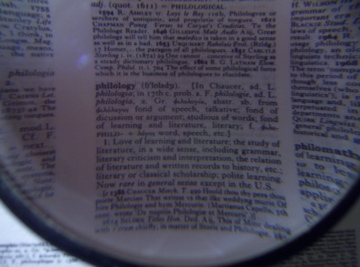 This dictionary has its own magnifying glass. 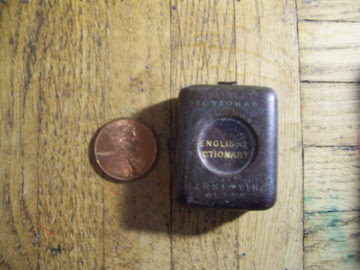 It was published by David Bryce and Son, Glasgow, around 1896 with the definitive title of The Smallest English Dictionary in the World. 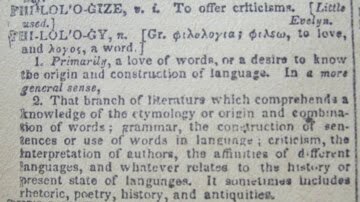 And the definition of philology, not to be seen by the naked eye without the use of a magnifier, is "science of origin, and history of language." 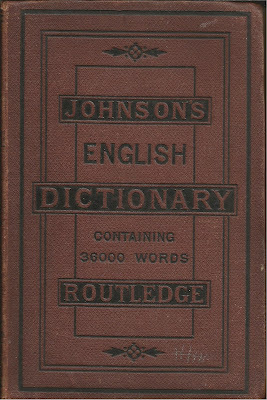 Next is my Thumb Dictionary, officially known as Bryce's Diamond English Dictionary, published by Bryce and Sons in Glasgow in 1896. 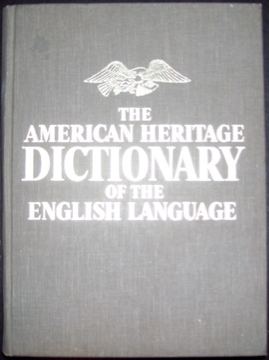 It is an expanded version of the preceding dictionary so it has the very same definition. That's it for now folks! 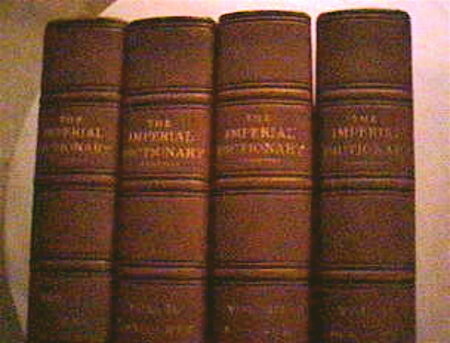 You can view my other dictionaries and books about dictionaries on Library Thing. Next month I will display and discuss my grammar books, including my Elements of Style collection.